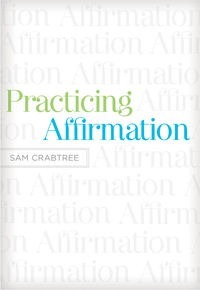 I am thoroughly enjoying “Practicing Affirmation” by Sam Crabtree. So far I would heartily recommend it to anyone but especially to pastors, teachers, and parents. Below is an excerpt from chapter two. For more detailed information about this book please click here. Generally, it is easy to affirm early in a relationship, because no offenses have been committed yet. But over the course of time, we can experience a growing desire to bring certain corrections to the table. Which will dominate? Affirmation or correction? Proportionality matters when it comes to affirmation, for affirmation can be choked out by criticism, correction, or mere indifference and neglect. How much affirmation is enough? There’s no magic number. Picture a horizontal line representing a continuum from a healthy diet of affirmation on one end to an insufficient quantity on the other. The affirmation in any given relationship can be plotted along the line. The same relationship can be plotted alone a line with the same meaning, but with different labels. Picture human relationships as ships on water. The natural winds blow them toward the left of the continuum. Wise people give intentional proactive energy to pulling relationships toward the right. The aim is not to find the precise point on the line that is justifiable, but to unmistakably (in the eyes of people around us) move toward the right. Robust proportionality between affirmation and correction may vary from relationship to relationship, and may even vary from season to season within the same relationship. Sometimes women send signals that they desire a little more refreshment during seasons such as pregnancy or mothering young children. Sometimes men take criticism more severely when they are running late or feel they are being made to run late by someone else. The point is not to calculate some once-and-for-all ratio, but to be actively refreshing. This is where we get in trouble: affirmations tend to evaporate over time. Meanwhile, corrections keep piling up. Corrections tend to out-number affirmations, and by doing so, corrections sabotage or undercut the value of affirmations. Occasions to correct keep arriving like a Mobius treadmill in perpetual motion. “You left the lights on in the car, dear.” “Finish your homework, son.” “Late again?” “Not that way; this way.” Individually, these are innocuous, and one might argue, necessary. But they pile up, and if not counterbalanced by an overwhelming gang of affirmations, they take over the flavor of the relationship. One hair in a casserole may not even be noticed, yet enough hair will result in choking. Some will choke even at the thought of hair in the their food; similarly, people may emotionally choke at the thought of any more correction coming from us. The importance of affirmation does not entirely remove the place of correction. We’re going to live with sinners. We’re going to marry a sinner. Our children will be sinners. Our parents are sinners. The people around us are going to pull boneheaded moves, and in love it will sometimes be our place to point them out. They are going to smell bad, and its our job to inform them before they go out in public. They will burn the burgers. They will do something that is mediocre, that will hurt the team or waste household finances, or something else regrettable. But love does not look first for ways to correct. Think this way: give so many affirmations as a pattern, a way of life, that you gain a reputation for it. You are known for your affirmations, not your criticisms, your corrections. In Acts 4:36 Barnabas is called the “son of encouragement.” What’s my reputation? Mr. Crabby Pants? Old Lady Battle-Axe? Miss Nit-Pick? We should unleash so many affirmations that those around us lose track. So, it’s not a matter of mathematical precision. It’s not a strict algebraic formula but a spiritually organic way of living, more like romance than rocket science, less like knitting (with its relentless counting: knit one, purl two), more like the weather – how much rain is enough? Well, that depends on how dry it’s been. And what yare trying to grow – a watermelon or a cactus? It takes more than one positive to overcome a negative. You hurt my feelings, so do something nice for me. Are we okay? Not usually yet. The bean counters are telling us that a healthy state in a system actually requires 3-5 positive events to overcome one negative event. Not only would [a robust affirmation ratio] tend towards softening the tone of the rare critique, but it ensures that the critical remark is heard in a larger context of love and delight. A guy might be thinking, “This doesn’t come easy for me. I’m not good at it. It’s not natural for me.” But men who desire mercy from God get busy refreshing their wives. You can decide to affirm. God will help you. You can dedicate yourself to it: “With God as my help, I am going to do this. I’m going to make a joyful prospect out of it.” You can tackle the mountain (the whole marriage relationship) and break it down into a bunch of easy-to-climb molehills of affirmation. But we must not be surprised in this fallen world if we encounter obstacles. What really jumped out at me was the word “daily.” What are all the implications of that? How should that look in a church body? Do communities of Christ practice this? It is scary to think just how hardened my life and many communities of Christ might just be but they don’t know it because they don’t encourage one another! Here then is the primary step toward realizing Hebrews 3:13 in communities of Christ – I must first be more worked up about my own sinfulness than the sinfulness of others. This I believe will protect me from “scolding one another daily,” or “suspecting one another daily” or “poking holes at one another daily” instead of “encouraging one another” and what is more this will enable me to be “encouraged” daily also that I might not be hardened by sin’s deceitfulness.